The Dutch studio band Crescent Moon consists of the brothers Eric and Frank Peters, and the teenagers Bas and Tim (twin sons of Frank). Their second prog album is called ‘Dissonance’. This themed album is a reflection of society, of our civilization. War and peace, and building up life after a war. It is also about the questions: Who are we? Are we on the right track? At the start of ‘Civilization’ you hear the chant: “Kill the pig-cut her throat – spill her blood” Then there is a cannon fire. That could have been a little louder for more impact. The music is directly more rocking than on their debut album ‘The Lidless Room’. The turn to a quieter piece is super! Because of the details and the layered production, I am already convinced in this opening track. ‘Scorched Earth’ is built up slowly with the sounds of a trumpet, the neighing of horses, and wagons that ride on a soggy surface. Frank drums a march, this together with the piano and the sound of strings gives a somber atmosphere. Matching a battlefield with fallen soldiers. The spoken words in ‘The Thin Red Line’ are partly drowned out by the music. This creates balance. The brass players are in a nice harmony. Again, the guitar solo of Chico Dommeck stands out. The tracks are fairly quiet and provide a wonderful flow. In the meantime, you have a lot to listen to. The layers in the music are nicely intertwined. There are all kinds of extra sounds / samples added and there are plenty of details to hear. Such as the sound of bar chimes and a xylophone. The acoustic guitar playing in ‘The Fall’ has beautiful, warm sounds. A little later the layers in the music are surprising again. There is a very good balance between strings and keys. A few times you hear some cool bass tones, always with a rest in between. Meanwhile, the spherically played keys create a pleasant tension field. Yet the mysterious atmosphere is preserved. This track dies away and ends up, almost unnoticed, in ‘Castles Burning’. By the melody I surely notice that this is a different track. In ‘Crossroads’ there are a few light creaks. Here, too, it stands out that the sound is well balanced over the headphones. The transition to ‘Maelstrom’ is wonderful. This last track is also fascinating. And ends with a march that slowly dies away. I can’t leave the artwork unmentioned. 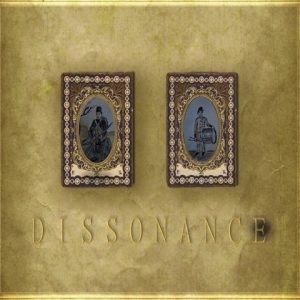 ‘Dissonance’ is published as a hardcover book with a CD. Margot Peters wrote out the lyrics by hand and made the drawings. This ‘diary’ looks like a collector’s item! It fits perfectly with the theme of the CD. This is nowhere ‘heavily loaded’, so the album remains accessible. The gentle voice of Frank fits perfectly with the pleasant flow of the whole. He does not have a large range in terms of pitch and volume. With that, Crescent Moon has a recognizable sound. In terms of tempo, there could have been a bit more variation in the vocals. On the other hand, singing and music are a unity. This is clearly well thought out. The marches are played fantastic, but in ‘Castles Burning’ the drumming is quite flat. The background vocals are usually used as an instrument. The voices melt, as it were, with the music. Sampling has been widely used. These added sounds are always in the benefit of the whole.